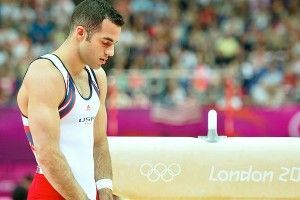 A disastrous showing by American gymnasts Danell Leyva and John Orozco on the pommel horse relegated their country to fifth place in the team finals, and the Chinese gymnasts won gold for the second straight Olympics. The Americans’ struggle casts doubt on their unique pommel philosophy, known as “Butter the Horse!,” though U.S. team coordinator Marta Karolyi put forth the possibility that maybe they didn’t “Butter the Horse!” enough. Less than 14 minutes after racing a semifinal heat in a different event, 17-year-old American Missy Franklin rallied to win gold in the 100-meter backstroke. The inspiring victory makes Franklin the youngest female American hero since Katniss Everdeen, AND NO, SHE WAS NOT FICTIONAL, YOU SHUT YOUR MOUTH! KATNISS WAS REAL AND SHE’LL SHOOT YOU WITH AN ARROW! Ryan Lochte failed to medal in the highly anticipated 200-meter freestyle, losing to Frenchman Yannick Agnel, who also out-dueled him in the final leg of the 4×100 relay. Agnel is officially the most annoying French person since Amelie, AND NO SHE WAS NOT FICTIONAL, HOW COULD A FAKE PERSON HAUNT MY DREAMS WITH HER HORRIBLE PIXIE SMILE?! American Matt Grevers set an Olympic record on his way to winning gold in the 100-meter backstroke. Unfortunately, his stern father still considers him “a lazy do-nothing” since he spends most of the time lying on his back. Kendrys Morales became the third switch-hitter in major league history to homer from both sides of the plate in the same inning as the Angels beat the Rangers 15-8. For those keeping track at home, A-Rod is still the only player to look at himself longingly in a handheld mirror from both sides of the plate in the same inning (he accidentally wandered to the left side the second time). Will Venable drove in four runs, three of them on a bases-loaded triple, as the Padres ended the Reds’ 10-game winning streak with an 11-5 rout. This was officially the longest winning streak in Cincinnati since a tourist walked almost eight blocks in the Over-the-Rhine neighborhood without having a rock thrown at his head. Mark Teixeira will undergo an MRI on his wrist after being forced to leave Monday’s game, a 5-4 Yankee loss to the Orioles. Sources report that he hurt his wrist when he picked up a handheld mirror out of curiosity after seeing it on the bench, and an enraged A-Rod hit him on the wrist with a bat.